For those who have been in the message for long, to question the honesty of William Branham appears almost blasphemous. But the Bible says that we are to discern all things and, in particular, those that claim to be prophets are to be judged (1 Cor 2:15, 1 Cor 14:29). A faithful witness will not lie: but a false witness will utter lies. If William Branham told lies, that would make him a false witness, according to the Bible. If William Branham was a false witness, and the Bible says Jesus is the true and faithful witness, then are we to be listening to the one who was wrong or right? Was William Branham the messenger to the Laodicean church? He can't be if he violated Proverbs 14:5. Was William Branham honest? If he can be shown to have distorted the truth or if his stories are constantly changing over time such that they vary significantly from their first telling, this would cast doubt on virtually everything that he said. The following list contains issues that raise questions regarding his honesty and truthfulness. Some of these concerns have only recently come to light but they are now sufficient in number that they should raise genuine concern on the part of anyone who is a follower of William Branham. William Branham said that he did not receive a proper education because he had to leave school as a young man to care for his siblings as a result of his father’s untimely death. William - (Married to Hope and had two children at the time of Charles’ death) - 27-29 years old depending on his birth date. Edward - Deceased. Had he been living, he would have been 27. Charles Jr. - Deceased. Would have been 15. 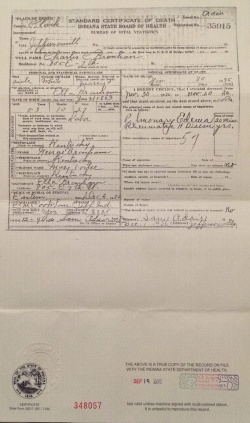 Based on newspaper reports and Charles Branham's death certificate, he was 53 years old at the time of his passing after fighting an illness for 10 months. William Branham’s brother Charles died in an accident on August 5, 1935. Sharon Rose Branham was born to William and Hope on October 27, 1936. William Branham’s father Charles passed away for real on November 30, 1936. So two children were born to William and Hope between his brother's passing and his father's passing. Hope and Sharon Rose both passed away in July 1937. First thing, I lost my daddy. I run over to the house to see him, picked him up in my arms like that, he looked up at me like that, he smiled. A doctor had give him a dose of medicine that killed him. One overdose of strychnine for his heart, and it killed him. ‘Course, there’s nothing said about that. The undertaker covers up the doctor’s mistakes many times. Nothing I got against doctors, but I say there’s nothing said about that. But my father died at fifty-two; drinking killed him. The next one to go was dad, went in a heart attack, died in my arms. I committed his soul to God: went suddenly, quick. Initially William Branham's retelling of the story of Congressman Upshaw's healing was in basic agreement with the story as told by the Congressman himself. However, it changed over time to become something that bore absolutely no resemblance to what actually happened. How many other stories that William Branham told were also wildly embellished? There is a heartbreaking story that is familiar to all followers of William Branham. Bro. Branham first encountered Pentecostal people at a convention in Mishawaka, Indiana. While he was drawn to them and was invited to speak in their churches, he refused to join with them because he listened to his mother-in-law instead of God. And, as a result, his wife and daughter died as a direct result of his disobedience to God. But, is this the truth? According to Roy Davis and Douglas Weaver, William Branham attended a Pentecostal church pastored by Roy Davis prior to 1933 when he started his own church. Roy Davis himself says that William Branham received the baptism of the Holy Spirit in his home. This all precedes the death of Hope and Sharon Rose Branham in July 1937. The original name of Branham Tabernacle was the Pentecostal Tabernacle. This makes the story of William Branham's story that his wife and daughter died because he rejected the Pentecostal people to be highly suspect. Why did William Branham state that the cloud was directly above him while he was hunting, when it actually appeared 8 days earlier 200 miles away? Why did he say that Life Magazine said the cloud appeared at the same place that he was hunting when it clearly didn't? Why does William Branham state that the pictures in Life Magazine were taken on the day that he heard the blast when they were actually taken over a week earlier? Why was there no mention of the voice on the Ohio River by William Branham prior to 1952? Why did the books by Gordon Lindsay and Julius Stadsklev make no mention of the voice (both books were written based on information that came from William Branham)? Why is there no evidence of the newspaper articles that William Branham referred to? Plagiarism is the act of taking someone else's work or ideas and passing them off as one's own. Are you aware that William Branham stole multiple messages, doctrines and concepts from other ministers but never properly gave them credit for them. Are you aware that some of these stolen ideas he said came directly from God or the Angel? On December 23, 1962, William Branham relates a vision in which he sees five angels in a constellation. One week later, he changed the number to seven. Why? In the big lie there is always a certain force of credibility; because the broad masses of a nation are always more easily corrupted in the deeper strata of their emotional nature than consciously or voluntarily; and thus in the primitive simplicity of their minds they more readily fall victims to the big lie than the small lie, since they themselves often tell small lies in little matters but would be ashamed to resort to large-scale falsehoods. It would never come into their heads to fabricate colossal untruths, and they would not believe that others could have the impudence to distort the truth so infamously. Even though the facts which prove this to be so may be brought clearly to their minds, they will still doubt and waver and will continue to think that there may be some other explanation. For the grossly impudent lie always leaves traces behind it, even after it has been nailed down, a fact which is known to all expert liars in this world and to all who conspire together in the art of lying. These people know only too well how to use falsehood for the basest purposes." If you try to say that William Branham was a true and faithful witness, then you aren't following Jesus. And if you are following Jesus, then you can't follow William Branham. It's one or the other. Did William Branham embellish the stories he told, or do his stories accurately represent the events as they happened? He said, "Why, the people that you speak before," said, "you ought to be ashamed of that grammar." I said, "I am, but it doesn't do me any good. I just don't know no better." I said, "When I was a boy, my father died. I had ten children to take care of, and I had to work and support my mother and the children. Then since the Lord has sent me out, why, I have--haven't had a chance." 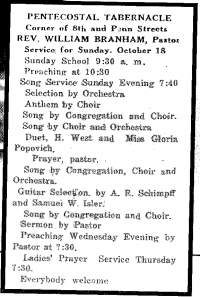 (November 29, 1953 – The Faith that was once delivered). It’s very clear that his poor English was from a lack of education, which was a direct result of his father passing away when he was a child. ...Daddy was eighteen years old; mama was fifteen when I was born, just children. (April 15, 1951, Life Story). So if William Branham was born when his father was 18, then he was 34 years old when his father died at the age of 52 in 1943. Let’s call a spade a spade: William Branham did not have poor English because his father died when he was a child. It’s just not true. So why did William Branham feel it necessary to invent the story that he was a boy when his Dad died? Was it to make people feel sorry for him? Or do you feel that he was being completely honest with this? If he wasn’t honest regarding his childhood, how do we know he was honest about other things? And Please don’t get mad at us, we are just letting you know what he said. ↑ The Holy Bible: King James Version, Electronic Edition of the 1900 Authorized Version. (Bellingham, WA: Logos Research Systems, Inc., 2009), Pr 14:5. ↑ The Holy Bible: King James Version, Electronic Edition of the 1900 Authorized Version. (Bellingham, WA: Logos Research Systems, Inc., 2009), Re 3:14. This page was last edited on 20 April 2019, at 01:15.